Massage therapy in Rockford, IL offers many health benefits and can help everyone. While massage provides well-needed relaxation, it is also very therapeutic to reduce pain and inflammation in the muscles and ligaments. It also aids in recovery from injury and workouts. Did you know that most insurances cover massage therapy if it is ordered by our doctors? Our 5 licensed massage therapists are on hand to help you relax, restore balance to your body, recover from injury and help you feel great! 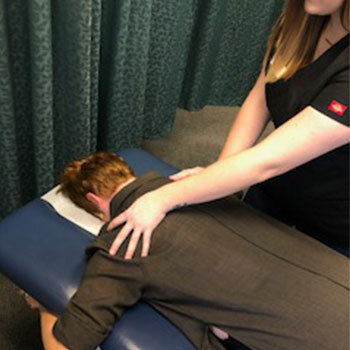 Our licensed massage therapists are doctor-supervised and work collaboratively with the other health care providers in the office which will help you achieve optimal results. You will feel better and more relaxed because of our unique integrative approach. Myofascial release is not massage. It is treatment that uses gently sustained pressure into restricted areas of myofascial tissue. As pressure is applied and sustained, the hardened, tight fascia softens into its unrestricted, pliable and mobile state again, relieving pressure on pain-sensitive structures and restoring mobility and function. Fascia is strong connective tissue that runs as a three-dimensional and continuous webbing throughout our bodies from the top of our head to the tips of our toes and fingers. It surrounds, supports and is embedded into every tissue and organ of our bodies and normally moves fluidly with our body while providing strength and support. However, traumas like a fall, whiplash injury, surgery, inflammation and even poor posture, can accumulate over time in the fascial tissue. These traumas can cause the fascia to harden, lose elasticity and exert excessive pressure on surrounding tissues such as blood vessels, organs, muscle, bone and nerves, thereby causing pain. Some of the conditions that can be treated with myofascial release are back, neck and chronic pain, headaches, carpal tunnel syndrome, fibromyalgia, TMJ problems, urinary incontinence, mastectomy pain, lymphedema, painful scars, coccygeal pain and restrictive mobility. Not all problems stem from fascial restrictions, though a surprisingly high percentage of cases do. This is often the case when all the standard tests such as CAT scans, MRIs, x-rays and myelograms are negative, and medications help only temporarily. During and after treatment, your pain should be relieved and in some cases eliminated. You will experience more flexibility, a better range-of-motion and the ability to resume many of your former activities. Swedish Massage: Also known as a traditional massage, this type of massage consists of long gliding strokes, kneading, shaking and tapping motions. It can be highly effective for a number of ailments because of the positive effects it produces on all layers and systems of the body. Swedish massage affects the nerves, muscles, glands, circulation and provides for the advancement of overall health and well being. Deep Tissue Massage: Deep tissue massage is similar to Swedish massage but the pressure is typically deeper and more beneficial to releasing chronic muscle tension. Deep tissue massage focuses on the deepest layers of the muscle tissue, tendons and protective layers of surrounding muscles, bones and joints. Prenatal Massage: Pregnancy massage relieves tension and aches caused by the extra weight and shift in center of gravity during the prenatal period. Pregnancy massage is designed to reduce swelling and fatigue as well as enhance energy and sooth the nervous system. Medical Massage or Chiropractic Massage: Medical massage is a therapeutic technique designed to reduce pain and inflammation in the muscles and ligaments and aid in the recovery from injury and workouts. Medical conditions including cancer, MS, and auto-immune diseases are addressed by targeting the key areas to alleviate the symptoms of chronic muscular discomfort, muscle tears, inflammation and sprains while improving circulation, lymph flow and range of motion. Sports Massage: Sports massage is used before or after sporting events to prepare each athlete for peak performance. This type of massage helps to relieve fatigue, reduce swelling, reduce muscle tension, promote flexibility, prevent injury and accelerate healing.